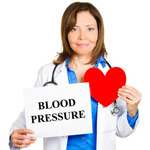 MONDAY, Oct. 20, 2014 (HealthDay News) -- Regular visits to your doctor can help keep your blood pressure under control, a new study shows. High blood pressure can cause serious health problems such as stroke and heart attack, according to the American Heart Association. Researchers analyzed data from 37,000 American adults who had their blood pressure checked between 1999 and 2012. Those who saw their doctor at least twice a year were 3.2 times more likely to keep their blood pressure under control than those who saw their doctor once a year or less. Even after controlling for factors such as diabetes, smoking and body fat, doctor visits were the strongest predictor of blood pressure control. Having health insurance and being treated for high cholesterol also improved the chances of keeping blood pressure in check, according to the study published Oct. 20 in the journal Circulation. The researchers also found that obese people were more likely to keep their blood pressure under control. This is "probably because doctors recognize the need to control risk factors and may be quicker to give them blood pressure medications," study author Dr. Brent Egan, a professor of medicine at the University of South Carolina School of Medicine, said in a journal news release. As many as 80 percent of the 78 million American adults with high blood pressure know they have the condition. But only 75 percent receive treatment, and only about half have it controlled under 140/90 mm Hg, according to the American Heart Association. People with blood pressure of 140/90 mm Hg or higher should make lifestyle changes such as losing weight, eating healthy, exercising and, if necessary, taking medication, the heart association advises.